Chisels, turning tools, etc, all need sharpening. Usually fresh out of the box. To completely remake an edge, my bench grinder gets the right shape going, and for repeated honing I have a fine diamond tool. But what about in-between? What to use after the grinder, but before the diamond hone? 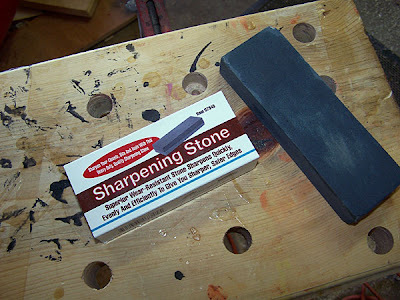 I picked up a cheap "Sharpening Stone" from Harbor Freight. This thing is NOT one of their "gems". At 99c (with a coupon) it was still too expensive. 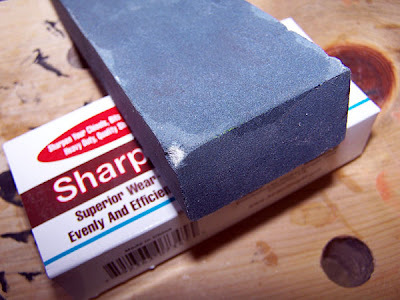 The stone, Item #07345, is labeled as "Superior Wear-Resistant Stone Sharpens Quickly, Evenly And Efficiently To Give You Sharper, Safer Edges" (poor capitalization theirs). It's crap. The sharpening material dissolves with sharpening oil! Running a tool across it quickly removes the gray material exposing the white core sandstone. The gray material is just a thin coating on top of a sandstone brick. Ugh. I got one use out of this tool, sharpening my 3 chisels, before I had to toss it. So a word to the wise: Spend the money and get a quality stone. Oilstone, waterstone, whatever. Just avoid this useless waste of space.